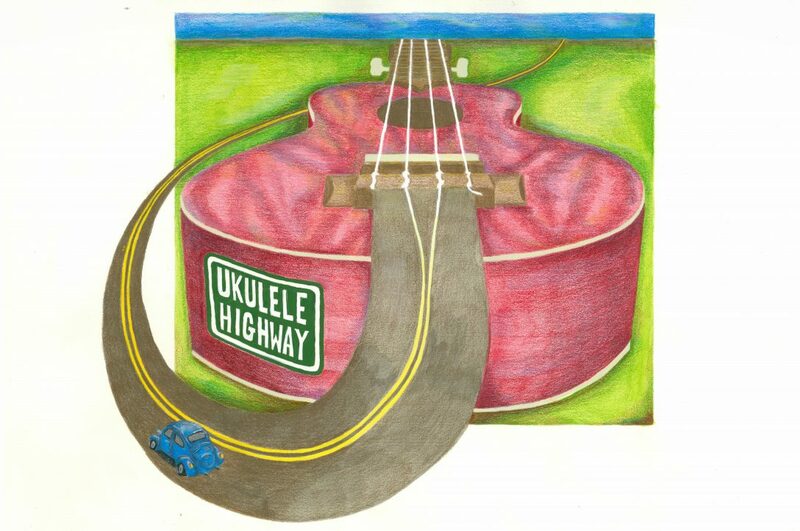 This month on Ukulele Highway our conversation about songwriting continues with singer/songwriter/ ukulele player Chrissy. Australian ukulele player/singer/songwriter Chrissy serves up some serious prowess on the four stringed instrument dipped in upbeat vibes and drizzled with commercial sensibilities. Her signature radio friendly riffs, rockin’ rhythms, and chordal bliss combine with witty lyricism, catchy melodies, and smooth vocals to place her in a unique category. Chrissy played with a number of well recognised groups in the Melbourne Ukulele scene, before striking out on her own, heading to the USA in 2018 to pursue her dream of screen writing and touring USA. Chrissy was awarded a PhD in in 2017 and her varied career includes journalism, helicopter pilot, and scriptwriter in addition to ukulele player/singer/songwriter. Aside from her original tunes, Chrissy loves to take well known classics and give them new life – jazzy renditions of Madonna’s ‘Into the Groove’ and Nirvana’s ‘Smells Like Teen Spirit’ both pay homage to musical influences and challenge audiences with radical interpretations. Chrissy is currently working on a score for a feature film, preparing to record her first album and will return to America this year to continuing touring her music and pursuing a screenwriting career.